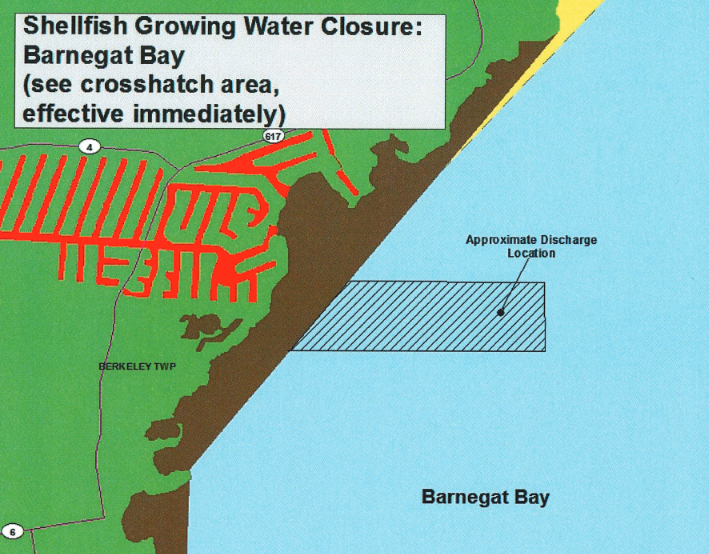 The state Department of Environmental Protection has issued a notice of violation to the Ocean County Utilities Authority over a pipe that was found to be leaking treated sewage into Barnegat Bay. The violation notice was issued Nov. 20, said Caryn Shinske, a DEP spokesperson. One day earlier, Shorebeat published a detailed story about the leak, which was discovered in October after OCUA injected dye into the pipe as part of a routine leak test that is conducted every five years. It is unknown how long the pipe was leaking secondary treated effluent into the bay. The notice, Shinske said, formally recognizes the issue and prescribes corrective action. The 54-inch pipe in question uses gravity to move treated sanitary sewer water from a treatment facility in Bayville, under Barnegat Bay and 5,000 feet into the Atlantic Ocean off South Seaside Park. The Oct. 9 dye test detected a leak about 1,400 feet east of the Allen Road pumping station, necessitating a second test Oct. 17 with divers present to investigate the source of the leak in person. “On October 18, the DEP received a tentative repair schedule from the contractor, which included approximately a month’s timeframe to mobilize equipment to the site, dig down approximately 10 feet to get to the pipe, remove the concrete encasement and prepare the pipe for the permanent custom-built clamp,” said Shinske. The day the violation notice was issued, the contractor installed a temporary repair that stopped the leak, which was verified by a secondary dye test and diver inspections, Shinske said. “The Ocean County Utilities Authority is awaiting delivery of the repair clamp to do the permanent repair, which is expected to be completed by the end of this week,” she added. Keith Marcoon, executive director of OCUA, previously told Shorebeat that Caldwell Marine, of Farmingdale, was tasked with performing the repairs. The utility contacted contractors within 24 hours of the leak being discovered and notified the DEP and a number of scientists and environmental groups. The agency did not, however, issue a press release to the general public. 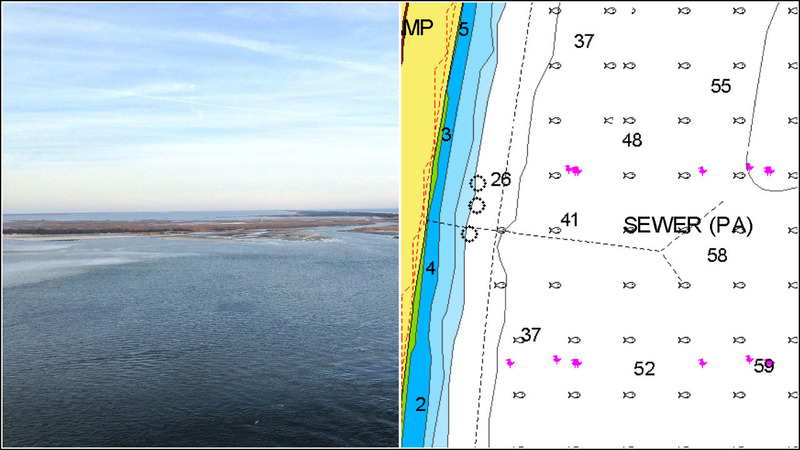 The DEP, for its part, closed clam beds in the area and publicly stated that a leak had been found on Oct. 12. Marcoon said the final repairs would be completed by the end of the month. “We immediately reported the suspected leak to New Jersey DEP and we continue to keep them updated of our findings and repair processes,” he said.